・Lid and Utility Organizers protect and customize your contents. 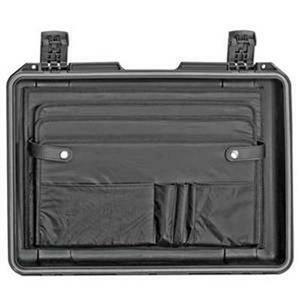 When you need to keep office supplies or smaller gear organized and protected customizing your Storm Case with a lightweight lid or utility organizer is the ideal solution. The organizers fit perfectly inside the case lid and are covered with water-resistant PVC-coated nylon fabric for durability and protection from the elements. Lid organizers are designed to hold documents notebooks and small electronic devices in expandable folder pockets. In addition to folder pockets and sleeves for office supplies the utility organizers include several versatile mesh nylon zipper pockets. These are perfect for housing items such as PDAs first aid supplies film rechargeable batteries and camera filters. Every type of organizer can be installed at the factory or delivered loose with hook and loop Velcro straps for you to adapt to your specific needs. Lid and utility organizers can be used in combination with a padded divider sets or foam for even greater flexibility.